Have you seen Sony's 11-inch OLED TV in person? The screen is fine and everything, but its design is awkward—as if vomited up by an engineer and never reassessed. 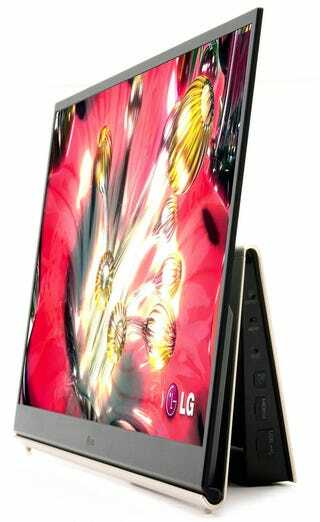 LG's 15-inch OLED, however, is at least trying. The design is both clever and functional, with the display's ports tucked behind the monitor in some sort of cross between a folded piece of paper and a photo frame. In turn, the necessarily hardware becomes its own stand, and the display can tilt, too (not that the viewing angle on most OLEDs is necessarily lacking).